From the moment Prince Imran fiddled and fondled with “that wonderful piece of Scottish engineering” – aka the key to the climax of the Commonwealth Games Opening Ceremony, owned by a rather important lady to his left – the tone had been set for the next 11 days. For 288 days we’d been waiting for the Queen to read her baton-encased manuscript to officially mark the start of the 20th Commonwealth Games, only for the middle man to fluff his lines. Cue the Knight. And with a chuckle from the Celtic Park stands and a twinkle in the eye of Sir Chris Hoy, on hand to make things all better in the saintly way he’d fulfilled his role as the figurehead of Glasgow 2014, there was a feeling that even if things went wrong everything would be alright in Scotland’s second city. In fact, arguably the biggest worry had already been appeased a couple of days earlier when the familiar Glasgow rain clouds cleared, the sun came out and, well, it never left. At least for a week. Glasgow was tropical. Naive as it would have been to rule out the risk of a heavy downpour, our foldaway macs never made it out of the day bag as we were treated to wall-to-wall sunshine and temperatures in the mid-late 20s. It was an opening week even Glasgow 2014′s most optimistic organisers couldn’t have dreamt of. And I for one was really glad that all who’d travelled up or were hoping to glue themselves to our BBC coverage for the coming days got to see the good lady Glasgow from her best angle. We’d just revelled in a month of football at its finest, the ‘best ever’ World Cup, played against the glorious backdrop of Brazil, so the last thing anybody wanted was a sub-satisfactory standard of sport played much closer to home under a shield of soggy brollies. And that – the last, yet most important piece of the puzzle – was the most overwhelming, the sport. Of course, without the world superpowers of USA, Russia, China etc, the pool of competition will always be diluted compared to an Olympics or single-event World Championships. But in most cases that did nothing to the quality of the sport and, like in London, we were all enthralled by the stories that unfolded, the new heroes who were uncovered and the overall success of our athletes. Though, unlike two years ago, we would enjoy the added subtext of watching the on-field battles being fought between Home Nations. To be at the heart of it, as always, was a real privilege. 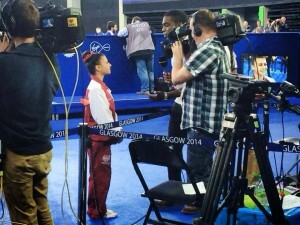 To see 16-year old Claudia Fragapane make history in winning her collection of gymnastics gold medals was truly special. As was watching two of the most epic individual apparatus battles in recent memory, as home favourites Dan Keatings won on the Pommel Horse and Dan Purvis took gold on the Parallel Bars – both atop a British clean sweep of the podium. 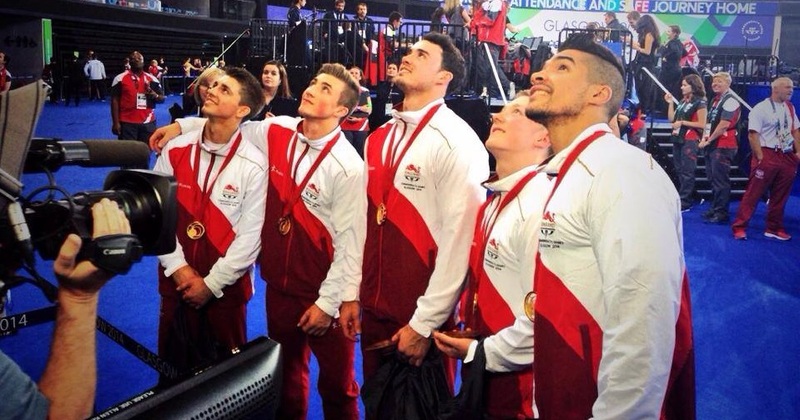 I’ve got to know the GB gymnasts a bit over the last few years so I couldn’t be prouder to see them reach the heights all their hard work merits and the recognition their achievements deserve. I’d have loved to have witnessed Ross Murdoch’s bottom lip-blubbering performance in the 200m Breaststroke, Brownlee take the triathlon title from Brownlee on the day Jodie Stimpson won the first gold of the Games for Team England, and to have sampled some of the Ibrox atmosphere that prompted ex-international Andy Nicol to call the Rugby Sevens competition “the best rugby Scotland’s ever seen”. I did get my fair share of front row seat action though, and I certainly can’t complain having been there to see Adam Gemili win 100m silver on a memorable night at Hampden Park. And from the front seats to the hot seat. 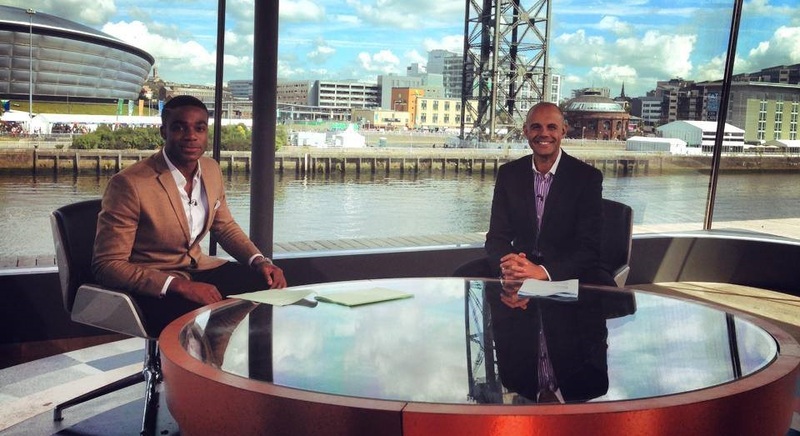 I’d always hoped to fill it one day, so to spend two mornings anchoring the BBC’s Commonwealth Games coverage live on BBC1 was indescribable. A big job with a big responsibility, but one I thoroughly enjoyed and look forward to doing more of in the future. Importantly, when my mother offers feedback on my work without a hint of criticism, I know she’s been done proud! They call them the Friendly Games, Commonwealth Chief Mike Hooper called the 20th edition the “Standout Games”. Having seen it and shared it with the city’s hospitable people I couldn’t agree more that those 11 days in Glasgow really were outstanding. To see a full gallery from Glasgow 2014, click here.